Reducing carbon dioxide emissions with high efficiency power stations using coal-derived fuel was a simple, affordable solution to climate change concerns. 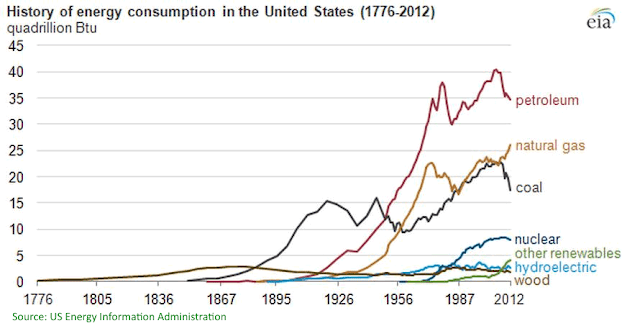 The coal lobby walked away from this solution because it reduces the demand for coal. The result of this arrogant, greedy and stupid approach is a collapse in the value of coal mining corporations with billions of dollars wiped off shareholders' funds. "Electricity from the new Prairie State coal-fired power plant now costs between 40 and 100 percent more than Peabody Energy originally promised, raising electric bills for 2.5 million ratepayers and costing hundreds of Midwestern towns millions of dollars apiece. ...spearheaded in 2012 by Peabody Energy, [the Prairie State coal plant] has saddled more than 200 Midwest communities with electricity costs that are unaffordable and that stand to hinder their economies for the next 30 years. Subpoenas have been pending for some time at the SEC and the case is being pressed in two lawsuits on the matter. 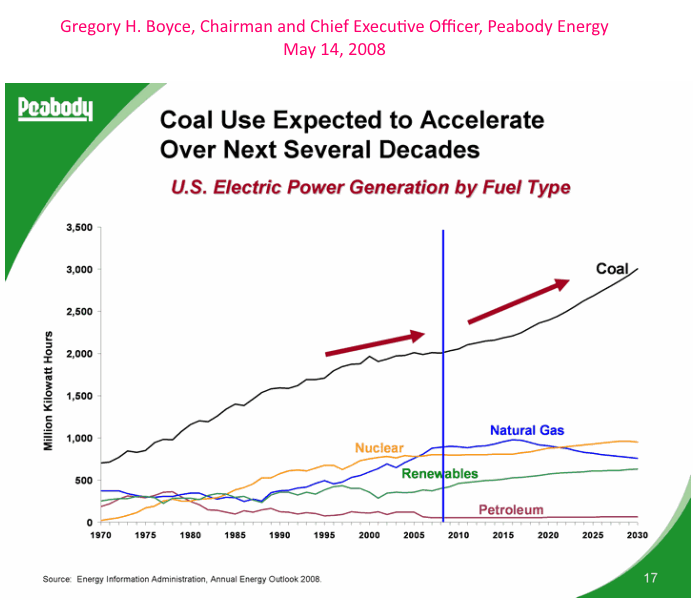 At issue are Peabody’s wildly optimistic projections and estimations that sold Prairie State as a source of cheap electricity to towns and cities now being crushed by the deal." 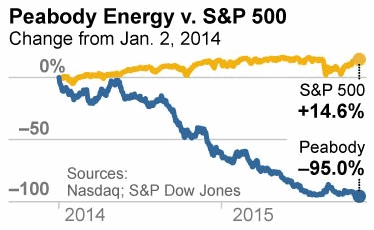 "Peabody Energy has been regularly closing higher-cost coal mines in order to remain profitable (profit/ton). After a few unfavorable years, the overall coal market outlook is positive, due to expected price increase, demand increase, and efficiency increase. However, the rapid decline of the market size will position few firms able to compete, as growth in other markets such as renewable energy and natural gas continues to surge. This trend is clearly demonstrated in the chart below." "Investors in Peabody Energy have lost over $16 billion of their stock value since the end of 2010, as the stock price has plunged from $64 per share to $4.50 per share. The company reports it has cut over 20% of its work force, and more layoffs seem likely as the company seeks ways to cut costs." "After a long investigation by the New York State attorney general, Peabody Energy says it’s going to do a better job of how it discloses the many financial risks it faces around climate change. In its next filing to the S.E.C., Peabody agreed to a fuller disclosure of the risks as well as projections by the International Energy Agency of lower global coal demand in the future, should stronger regulatory action be taken around the world. The risks noted will include unfavorable lending trends for financing coal-fueled power plants overseas as well as divestment campaigns targeting the investment community, “which could significantly affect demand for our products or our securities.”"
ABC censors report "Apprentice in coma after collapsing during unprecedented Adelaide December heat"
"Adelaide apprentice in hospital after suffering from heat stress; union calls for tighter regulations"
An apprentice remains in a coma after collapsing on a work site and a second has been taken to hospital during the worst December heatwave on record in Adelaide. Travis Mellor, 17, was into just his third day of work when he was rushed unconscious to hospital in an ambulance due to a heat stroke. He is believed to have just started a carpentry apprenticeship and was working on an eastern suburbs building site. On Friday, a second worker on an Adelaide building site was admitted to hospital but authorities later said his condition was not life threatening. SafeWork SA is investigating both incidents and the Master Builders' Association is urging builders to ensure they are working in a safe environment given the extreme conditions. Adelaide's burst of heat officially became a heatwave, according to Bureau of Meteorology forecasters, just before 2:00pm when the city's maximum officially exceeded 40 degrees Celsius for a third consecutive day. The mercury hit 40.8C, but it was as much as 10 degrees cooler at times along Adelaide's coastal suburbs because of a sea breeze. A change is expected to sweep across South Australia at the weekend, with another brief burst of heat tipped for Adelaide next week. The weather bureau has forecast 39C for Christmas Eve, but a partly cloudy Christmas Day in Adelaide with a high of 29C. SA Health said 62 people across the state had gone to a hospital for heat-related illnesses in the 24 hours since 8:00am on Thursday, and 21 of those were admitted. Some 31 people have been admitted to hospital because of heat-related issues since Wednesday when temperatures reached 41C. Construction, Forestry, Mining and Energy Union (CFMEU) state secretary Aaron Cartledge said Mr Mellor was drifting in and out of coma and his family feared he could face long-term health issues. "He's facing a real battle at the moment, some serious medical issues that are facing him, things like issues with his kidneys at the moment," he said. "He also looks like he's got a lung infection." The CFMEU said heatstroke was a serious condition that could cause lifelong injuries. It said there had been cases of paralysis in Queensland workers as a result of heat stroke. Heatwaves kill far more people than other natural disasters. Adequate preparation is essential, especially for people at high risk such as the elderly and young children. ABC Emergency has a checklist of things you can do to be ready. Mr Cartledge said employers needed to understand their obligations not to put workers at risk in extreme heat. "It is utter negligence that his employer did not make a decision to stop work when the temperature had reached 41.5 degrees," he said. "Travis is still a child, who had no idea of the danger of toiling in those kinds of conditions." Master Builders' Association chief executive Ian Markos said the safety of workers must be a top priority. "Heat stress is a safety issue so the main message we're saying is that there obviously is a responsibility for all employers to make sure they're working in a safe environment," he said. Adelaide's temperature reached 42.9C on Thursday afternoon and dropped to 23C overnight, although Coober Pedy and Woomera, in the state's north, both experienced a much hotter minimum of 29C. BoM's definition of a heatwave for Adelaide is five consecutive days with maximum temperatures at or above 35C or three consecutive days at or above 40C. Adelaide has never before recorded a run of four days above 40C in December, with Saturday tipped to peak at 43C before a change on Sunday is expected to reduce maximums to 27C. South Australia BoM acting regional director John Nairn yesterday said it was a sign of climate change. Mark Anolak from Bureau of Meteorology said SA was is in the grip of a nasty front. SA Ambulance paramedic Graeme Rayson said extra staff had been put on to help those affected by the heat and to make sure ambulance officers themselves were safe. "Some of the people have been working for a number of days," he said. "They're probably starting to feel the heat as much as the public are and we need to make sure that we look after our teams as well as the community." Five districts are in total fire bans, with severe danger ratings declared for the Mount Lofty Ranges, Murraylands, Riverland, Mid-North and Flinders districts. "Luckily enough there's not too much wind around," Mr Anolak said. "There is a little bit of wind around and enough to produce severe fire danger ratings ... Tomorrow with the temperature rising again, I imagine we'll certainly have some fire bans." Thoroughbred Racing SA (TRSA) has cancelled Saturday's race meet at Morphettville due to the hot weather but tonight's Twilight Races will go ahead as planned. "As with every race day, the health and safety of participants is our number one priority and we have therefore decided it is the best interests of the horses, jockeys and our staff to cancel tomorrow's racing," TRSA chief executive Jim Watters said. The Country Fire Service (CFS) and Local Government Association have appealed to property owners in bushfire prone areas around the state to ensure that their blocks were cleared. LGA president Dave Burgess said 10 per cent of properties surveyed as part of the councils' bushfire prevention strategies were not complying with bushfire safety standards and infringement notices had been issued. "The councils will go out and inspect those properties again and if people still aren't complying then they will be issued fines," he said. Fire prevention officers have been inspecting properties in all council districts since October. If a property owner is found to not be complying they can be issued with an expiation notice of $315. The State Emergency Service (SES) also warned people to be aware branches could fall without warning from trees which were stressed by the extreme weather. Its personnel have already dealt with a number of callouts, including at Tea Tree Gully in Adelaide's north-east suburbs. A mild change is expected to reach western parts of SA on Saturday and areas further east on Sunday.